A natural satellite is an object that orbits a planet or other body larger than itself and which is not man-made. Such objects are often called moons. The term is normally used to identify non-artificial satellites of planets, dwarf planets, or minor planets. 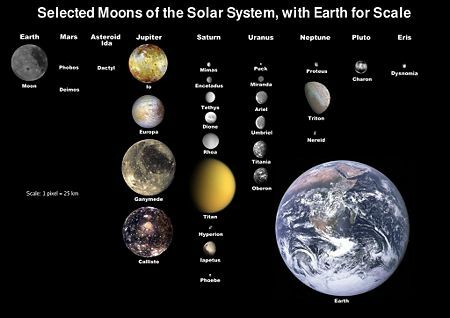 There are 240 known moons within the solar system, including 163 orbiting the planets, four orbiting dwarf planets, and dozens more orbiting small solar system bodies. The large gas giants have extensive systems of natural satellites, including half a dozen comparable in size to the Earth's moon. Of the inner planets, Mercury and Venus have no moon at all; Earth has one large moon (the Moon); and Mars has two tiny moons: Phobos and Deimos. Among the dwarf planets, Ceres has no moons (though many objects in the asteroid belt do), Eris has one: Dysnomia, and Pluto has three known satellites: Nix, Hydra, and a large companion called Charon. The Pluto-Charon system is unusual in that the center of mass lies in open space between the two, a characteristic of a double planet system. The orbital properties and compositions of natural satellites provides us with important information on the origin and evolution of the satellite system. Especially a system of natural satellites orbiting around a gas giant can be regarded as a miniature solar system that contains precious clues for studying the formation of solar systems. Natural satellites orbiting relatively close to the planet on prograde orbits (regular satellites) are generally believed to have been formed out of the same collapsing region of the protoplanetary disk that gave rise to its primary. In contrast, irregular satellites (generally orbiting on distant, inclined, eccentric and/or retrograde orbits) are thought to be captured asteroids possibly further fragmented by collisions. The Earth-Moon and possibly Pluto-Charon systems are exceptions among large bodies in that they are believed to have originated by the collision of two large proto-planetary objects (see the giant impact hypothesis). The material that would have been placed in orbit around the central body is predicted to have reaccreted to form one or more orbiting moons. As opposed to planetary-sized bodies, asteroid moons are thought to commonly form by this process. Most regular natural satellites in the solar system are tidally locked to their primaries, meaning that one side of the moon is always turned toward the planet. Exceptions include Saturn's moon Hyperion, which rotates chaotically because of a variety of external influences. In contrast, the outer moons of the gas giants (irregular satellites) are too far away to become 'locked'. For example, Jupiter's moon Himalia, Saturn's moon Phoebe and Neptune's Nereid have rotation period in the range of ten hours compared with their orbital periods of hundreds of days. No "moons of moons" (natural satellites that orbit the natural satellite of another body) are known. It is uncertain whether such objects can be stable in the long term. In most cases, the tidal effects of their primaries make such a system unstable; the gravity from other nearby objects (most notably the primary) would perturb the orbit of the moon's moon until it broke away or impacted its primary. In theory, a secondary satellite could exist in a primary satellite's Hill sphere, outside of which it would be lost because of the greater gravitational pull of the planet (or other object) that the primary satellite orbits. For example, the Moon orbits the Earth because the Moon is 370,000 km from Earth, well within Earth's Hill sphere, which has a radius of 1.5 million km (0.01 AU or 235 Earth radii). If a Moon-sized object were to orbit the Earth outside its Hill sphere, it would soon be captured by the Sun and become a dwarf planet in a near-Earth orbit. Two moons are known to have small companions at their L4 and L5 Lagrangian points, which are about sixty degrees ahead of and behind the body in its orbit. These companions are called Trojan moons, because their positions are comparable to the positions of the Trojan asteroids relative to Jupiter. Such objects are Telesto and Calypso, which are the leading and following companions respectively of Tethys; and Helene and Polydeuces, which are the leading and following companions of Dione. The discovery of 243 Ida's moon Dactyl in the early 1990s confirms that some asteroids also have moons. Some, like 90 Antiope, are double asteroids with two equal-sized components. The asteroid 87 Sylvia has two moons. The largest natural satellites in the solar system (those bigger than about 3,000 kilometers across) are Earth's moon, Jupiter's Galilean moons (Io, Europa, Ganymede, and Callisto), Saturn's moon Titan, and Neptune's captured moon Triton. For smaller moons see the articles on the appropriate planet. In addition to the moons of the various planets there are also over 80 known moons of the dwarf planets, asteroids and other small solar system bodies. Some studies estimate that up to 15 percent of all trans-Neptunian objects could have satellites. The following is a comparative table classifying the moons of the solar system by diameter. The column on the right includes some notable planets, dwarf planets, asteroids, and trans-Neptunian objects for comparison. The first known natural satellite was the Moon (Luna in Latin). Until the discovery of the Galilean satellites in 1610, however, there was no opportunity for referring to such objects as a class. Galileo chose to refer to his discoveries as Planetæ ("planets"), but later discoverers chose other terms to distinguish them from the objects they orbited. Christiaan Huygens, the discoverer of Titan, was the first to use the term moon for such objects, calling Titan Luna Saturni or Luna Saturnia—"Saturn's moon" or "The Saturnian moon," because it stood in the same relation to Saturn as the Moon did to the Earth. As additional moons of Saturn were discovered, however, this term was abandoned. Giovanni Domenico Cassini sometimes referred to his discoveries as planètes in French, but more often as satellites, using a term derived from the Latin satelles, meaning "guard," "attendant," or "companion," because the satellites accompanied their primary planet in their journey through the heavens. The term satellite thus became the normal one for referring to an object orbiting a planet, as it avoided the ambiguity of "moon." In 1957, however, the launching of the artificial object Sputnik created a need for new terminology. The terms man-made satellite or artificial moon were very quickly abandoned in favor of the simpler satellite, and as a consequence, the term has come to be linked primarily with artificial objects flown in space – including, sometimes, even those which are not in orbit around a planet. As a consequence of this shift in meaning, the term moon, which continued to be used in a generic sense in works of popular science and in fiction, has regained respectability and is now used interchangeably with satellite, even in scientific articles. When it is necessary to avoid both the ambiguity of confusion with the Earth's moon on the one hand, and artificial satellites on the other, the term natural satellite (using "natural" in a sense opposed to "artificial") is used. There has been some debate about the precise definition of a moon. This debate has been caused by the presence of orbital systems where the difference in mass between the larger body and its satellite are not as pronounced as in more typical systems. Two examples are the Pluto-Charon system and the Earth-Moon System. The presence of these systems has caused a debate about where to precisely draw the line between a double body system, and a main body-satellite system. The most common definition rests upon whether the barycentre is below the surface of the larger body, though this is unofficial and somewhat arbitrary. At the other end of the spectrum there are many ice/rock clumps that form ring systems around the solar system's gas giants, and there is no set point to define when one of these clumps is large enough to be classified as a moon. The term "moonlet" is sometimes used to refer to extremely small objects in orbit around a larger body, but again there is no official definition. ↑ Canup, R. and E. Asphaug (2001). Origin of the Moon in a giant impact near the end of the Earth's formation. Nature 412: 708-712. ↑ Stern, S., H. Weaver, A. Steffl, M. Mutchler, W. Merline, M. Buie, E. Young, L. Young, and J. Spencer (2006). A giant impact origin for Pluto’s small moons and satellite multiplicity in the Kuiper belt. Nature 439: 946-949. ↑ Marchis, F., P. Descamps, D. Hestroffer and J. Berthier (2005). Discovery of the triple asteroidal system 87 Sylvia. Nature 436: 822-824. Retrieved July 2, 2007. ↑ This column lists objects that are moons of small solar system bodies, not small solar system bodies themselves. ↑ Sometimes referred to as "Luna". ↑ 6.0 6.1 Diameters of the new Plutonian satellites are still very poorly known, but they are estimated to lie between 44 and 130 km. This page was last modified on 13 November 2018, at 17:15.